About a month ago, I was in Taipei for the annual Fulbright Research Workshop. This conference is hosted each year by Fulbright Taiwan to bring together scholars and researchers working in mainland China, Taiwan, Hong Kong, and Macau. It was a really great experience, and also very strange. Why was it great? I learned so much about Taiwan’s history, its politics, and its culture, and how these all fit into the larger picture of East Asian 20th century history in relation to the world (and by world, I mean predominantly the U.S., but with imperial echoes). Having known very staunchly Taiwanese American individuals in California, I had always thought of Taiwan as defined by its relationship to mainland China – and so to me, Taiwanese history and identity began with 1949. I had no idea that parts of Taiwan had once been controlled by – get ready – the Dutch (1624–1662), by the Spanish (1626–1642; considering Taiwan’s proximity to the Philippines, this makes sense), by Chinese Ming dynasty supporters (1662–1683), by the Qing government/empire (1683–1895) – then a short period of independence as Formosa, which lasted less than a year (1895) – followed by the Japanese empire (1895–1945), and lastly by the Nationalists (國民黨), which kept Taiwan under the longest period of martial law for any country in the world from 1949-1987 (except that in 2011, Syria won that title). During this period of martial law, known as the White Terror (白色恐怖), some 140,000 Taiwanese were imprisoned, and between 3,000-4,000 were executed. Keep in mind that throughout most of this time, the United States backed Taiwan with financial and military support, in order to protect it from mainland China and the global bad guys of the Cold War, the Communists. Taiwan became America’s “cornerstone in the Pacific Rim,” and thus, despite American rhetoric of freedom and liberty, etc, the U.S. supported an authoritarian regime.¹ This is a politically explosive claim, but in comparing the U.S.’s historical role in both, I like to think of this as the period when Taiwan was something like the Israel of the Pacific. Since 1987, Taiwan (officially known as the Republic of China (ROC), in contrast with the mainland, which is the People’s Republic of China (PRC)) has increasingly democratized. This was a very rare and wonderful moment in which a dictator decided to step down, and there are now multi-party elections, social movements, NGOs, big protests, and all that. What’s really amazing to me is that Taiwan has also begun public discussions of the White Terror, as my poor-quality photo of the White Terror Memorial above shows. This discussion has gone to the point of recognizing the government’s role in human rights violations at the very highest levels. As a friend once said, Taiwan is a special place because it’s one of the examples that disproves the stereotype that Asian (more specifically, Chinese) people can’t have democratic states. So, visiting Taiwan was a great learning experience! To be in a place and to learn its history, and to feel – tangibly – the ways that the history has impacted the place – that’s what I love about traveling. But of course, all of this fascinating history also makes Taiwan a very strange place. It was extra strange to be a Chinese American and a (temporary) Hong Kong resident visiting Taiwan, attending a conference supported by American and Taiwanese government funding, and thinking about these issues of history, memory, identity, culture, nationalism, while keeping in mind the recent Umbrella Movement and its frequent object of comparison, the Taiwanese Sunflower Movement. And what really struck me, throughout the entire conference, was this notion of “civility” as a Taiwanese trait. This key idea of “civility” has been a constant refrain in Hong Kong as well, especially with the way that foreign media treated the Umbrella Movement as the most polite protest ever (see: the UK Independent, the US-based Quartz, the New York Times…). I commented on it a few times in previous blog posts (see my footnotes here, and notice the use of the word “civilised policing” – directed toward a white officer – in a Tweet here). 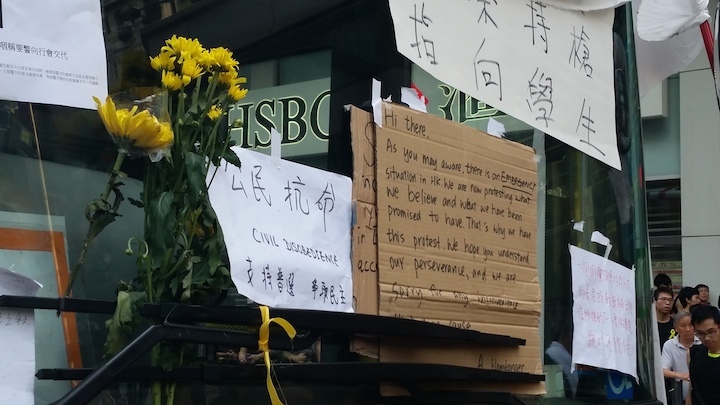 Hong Kong’s protesters were depicted as so polite, so unusually kind in their persistence, and therefore worthy of global sympathy and support. That should all be good, positive commentary, right? But it was really uncomfortable to see, as an Asian American. It was too familiar. For those readers new to Asian American history and to the current racial discourse of Asians in the United States, here’s quick breakdown. Asians have been in the United States for centuries – Filipinos, for instance, landed in California alongside the Spanish in the late 1500s – but it was only in the 1960s that they became seen as what’s now called the “model minority.” Several currents intersected to make this happen. After Japanese Americans were interned in World War II, with all their homes and businesses confiscated, their communities gradually recovered economically. In the 1960s, a huge number of middle- and upper-class Asians began immigrating to the US, bringing skills and capital with them. Around the same time, the four “Asian Tigers” began to become economic stars in Asia. In the 1950s and ’60s, Black Americans agitated for their rights, highlighting the structural inequalities and racism that held them back. Now let’s examine some of the rhetoric around Hong Kong’s protest coming from Western media. I particularly like this BBC article, “Things that could only happen in a Hong Kong protest,” a classic list-style article that lends itself to a quick summary here. China! China, you’ve surpassed us once more. I can’t believe this, first the Chinese beat us at business with Alibaba, now they’re doing protests better than us – they’re beating us at both the Occupy, and the Wall Street. It’s not fair! What I found really interesting in the article is its emphasis on the Umbrella Movement as a radical act, similar to the Ferguson protests as an “awe-inspiring demonstration of power,” and as a clear rejection of model minority stereotypes. …for Hong Kong protesters to speak out as loudly and as compellingly as they are right now is not just an act of defiance against the power of Chinese government authority, but also an act of defiance against the anti-Asian stereotypes that oppress all of us within the Asian diaspora regardless of the land we stand upon. To be clear, I love Reappropriate. It’s just amazing for the quality of writing and the critical platform it gives Asian Americans to challenge dominant discourses of race, class, and gender in the United States. But I think its Asian American context made the author treat the Umbrella Movement in its early stages as much more radical in its meaning than perhaps the Movement’s protesters meant it to be. 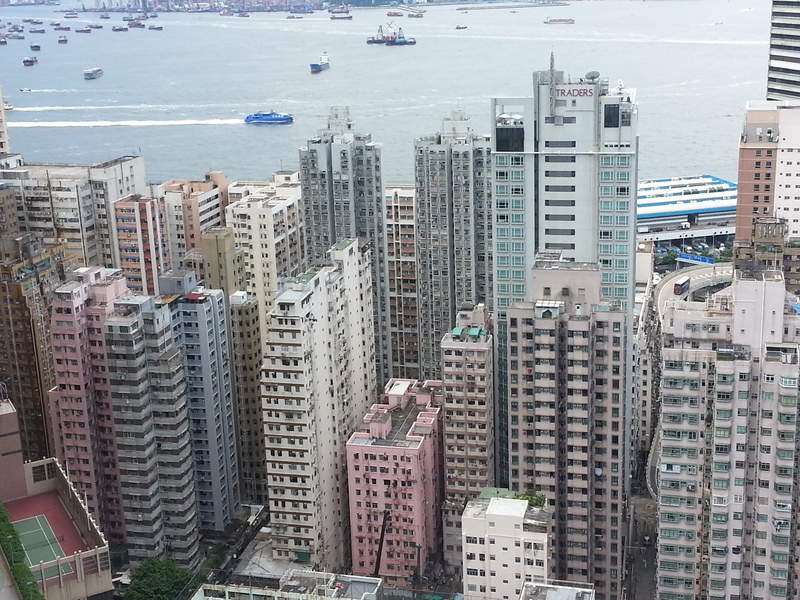 As you may aware, there is an EMERGENCY situation in HK. We are now protesting we believe and what we have been promised to have. That’s why we have this protest. We hope you understand our perseverance, and we are sorry for any inconvenience. The article was published on October 1, before the protesters themselves began to take more physical initiatives in November. October was a time when protesters took pride in their politeness. In contrast with the masked men who started fights at Occupy sites, the protesters emphasized that they were peaceful, civil, non-violent, non-reactive. At that time, I wouldn’t say that the Umbrella Movement was resisting the idea of the model minority – in a paradoxical way, they embraced it. They leveraged it as a political tool to show the world that Hong Kong protesters had the moral high ground, demonstrated in their politeness and their utter civility. See, for instance, the numerous notices posted in public spaces apologizing for their disruptiveness and requesting sympathy – in English, the language of foreign media and the international community. I’m including this photo that I took in Mong Kok on September 29 as an example. It wasn’t until November and the perceived collapse of the Occupy Central and HKFS leadership that a wide base of people really began pushing for more active forms of protest and resistance through alternative platforms like the Action Stage. That’s what I would call a stronger form of resistance to the model minority myth. But the roots of this resistance, I’d argue, aren’t in responding to a Western stereotype, but rather in responding to a prevailing concern with civility and social order in Hong Kong that activists feel is preventing real change. So, we have multiple actors casting multiple interpretations around this idea of civility. Western media promoted Hong Kong protesters as civil, and thus implicitly suggested that they deserved attention, respect, and sympathy; this fell in line with the model minority narrative. Asian American progressives promoted the Hong Kong protesters as determinedly not politely docile, resisting not only political oppression from China but also racial oppression from Western stereotypes. Hong Kong protesters (in the early stages, at least) embraced the identity of a nonviolent civil disobedience action and emphasized the civility of their behavior to legitimize the movement. (There’s still the question of just who the protesters targeted as their audience in need of convincing, which I’ll discuss more in the next post.) And now you have me, drawing together these interpretations to try and come up with my own interpretation of civility, what it means, and how it functions. The concept is really so rich – the term itself brings up everything from civil disobedience and civic participation, to civilized and civilization (which brings us to the tricky questions of Eastern and Western civilizations and values, global values, modern values/traits, and so on). It brings to mind debates over political correctness as well, which then leads to debates over freedom of speech. So much to think about! Thinking about this question has taken a really long time for me, and the ideas I’m putting out here are a first attempt at putting together these pieces. I recognize that I haven’t talked at all about what I mean by the concept of civility appearing in the Taipei workshop. I’ll get into that in my next post, but in this one I just wanted to go over some of the ideas I’m working with. It’s a lot of information already, and I’ll probably come back and edit things or move things around as I write the next post(s). To everyone who read this far – thank you so much for staying with me as I mull over these thoughts! I know it’s a lot of text to get through (I hear you, family). ¹Tien Hung-Mao and Shiau Chyuan-jeng, “Taiwan’s Democratization: A Summary,” World Affairs 155.2 (fall 1992): 58-61; and Hu Ching-fen, “Taiwan’s Geopolitics and Chiang Ching-Kuo’s Decision to Democratize Taiwan,” Stanford Journal of East Asian Affairs 5.1 (winter 2005): 26-44 [link]. ²Some great books are out on the history of the model minority myth, such as Ellen Wu’s The Color of Success: Asian Americans and the Origins of the Model Minority (2013), and Madeline Hsu’s The Good Immigrants: How the Yellow Peril Became the Model Minority (2015).